This page covers the overview, credentials, terms, disclaimers, and affiliate disclosure information. 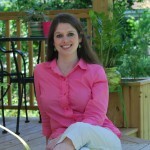 TammyWhitten.com is a division of Tammy Whitten, MS, LMFT, CFLE, PLLC. 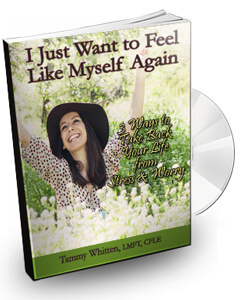 TammyWhitten.com separates out the therapy portion of my practice from my family life education component (which is housed at WomenManagingStress.com). The information provided here on this site is meant to help explain how sessions, treatment, billing, etc. work for therapy client,. It also provides access to the secure client portal, where scheduling and other confidential information is kept in a HIPAA compliant, encrypted setting. If you are contacting me about personal details and other health information, you are encouraged to access the client portal, set up a free account, and contact me there in order to fully protect your data. On the blog section of this website, information is shared explaining more about therapy, treatment models, mental health, parenting, and relationships. While this information is backed by research, many portions of the blog posts may contain my opinion. This blog, along with other website components, should not be used as a substitute for therapy or other health treatment. It is meant to be used to help explain how I work for potential and current clients. This can help clients to feel comfortable and to have positive outcomes in their treatment when they have more of an understanding of what to expect. If you are not a therapy client of mine, the information may be beneficial in enriching your existing therapy or health care concerns. Please be sure to share any questions you may have with your health care providers. Implementing the tips and suggestions here does not guarantee success or a change. Never do something you are uncomfortable with or unsure about. The material provided here is for informational purposes only, and it is not meant to serve as a substitute for seeking proper medical care, assessment, diagnosis, or treatment. Do not disregard seeking out competent advice from a licensed mental health or health professional because of something you read on this site. TammyWhitten.com is not an emergency service. If you believe that you have an emergency (health, mental health, domestic violence, or otherwise), please call 9-1-1 immediately. TammyWhitten.com also shares some information to help mental health professionals and family life educators about building an online practice. All information here is meant to be helpful, and is not a substitute for legal advice. 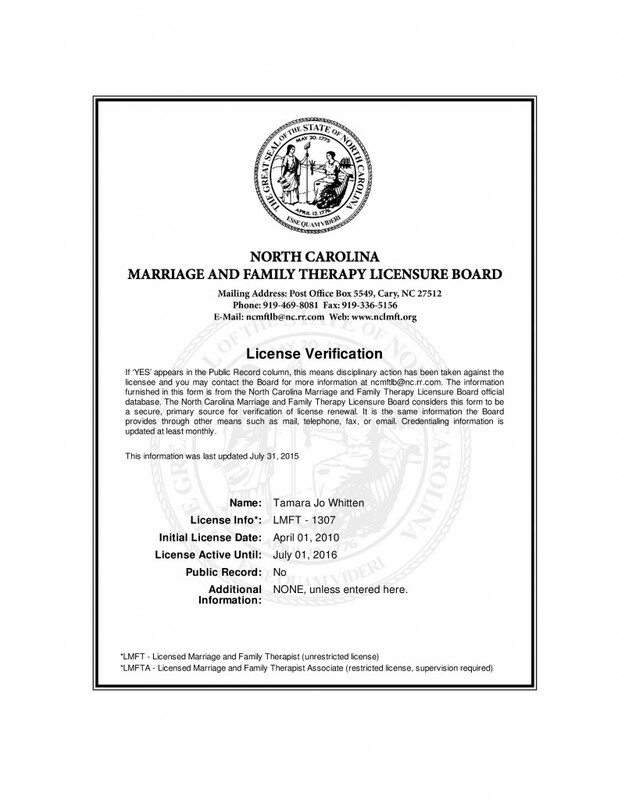 I am a Licensed Marriage and Family Therapist in North Carolina (#1307) and Virginia (#0717001401). 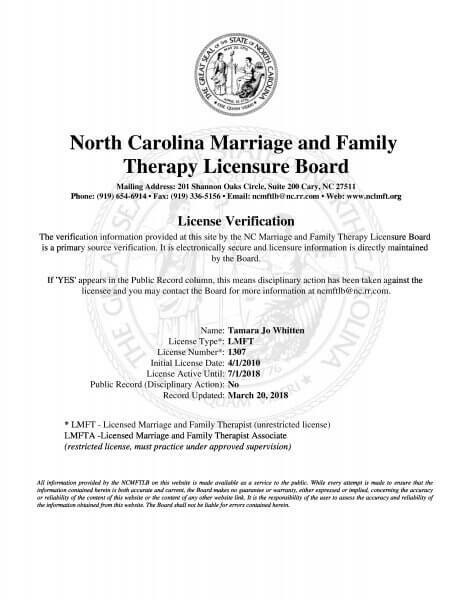 I only provide therapy services to those who are located in North Carolina and Virginia. 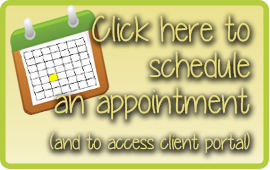 Therapy is available in my office in Greenville, NC, and via phone, email, online chat, and online video. Email, chat, and video are provided through the HIPAA compliant and secure client portal. 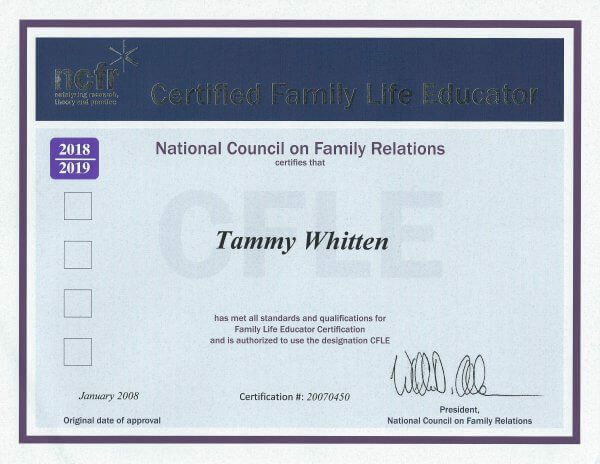 I am also a Certified Family Life Educator from the National Council on Family Relations, with credentials to help teach and prevent many of the issues that bring individuals, couples, and families to therapy. These services are offered on WomenManagingStress.com, in my office, the local community, and beyond North Carolina via interviews, seminars, classes, etc. over the internet or in-person. I have completed training in Emotionally Focused Therapy, completing both the externship and the core skills advanced training from the International Centre for Excellence in Emotionally Focused Therapy. Currently, I’m pursuing full certification in EFT and uses these skills with the couples she works with, provided they are a fit for the model. Additionally, I am completing certification in Cognitive Behavioral Therapy from the Cleveland Center for Cognitive Therapy. CBT is integrated into my treatment as well. For additional information about my training and credentials, please see the About page. There is one exception to using the information on this site for commercial use. There is a category on the blog called, “For Therapists.” There, information regarding certain products, programs, trainings, books, and other information is shared with the intended purpose for other clinicians to benefit from my work in finding valued resources. Pertinent links, often marked as “affiliate” links, will be shared there. If you have questions and would like to verify if something is available for your use in a commercial setting, please contact me. Great efforts have been made to ensure that proper ownership and attribution has been made for graphics, photos, fonts, and other materials. To use such without your own permissions and licenses is in violation. Payment for therapy services is expected at the time of the session. Payments are non-refundable. If you have questions or concerns about your treatment, or if you believe an error has been made in your billing, please alert me so we can work together to address this. I strive to provide the best services. 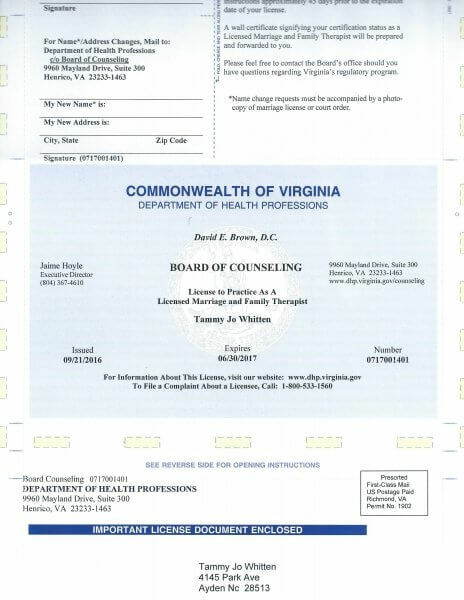 Therapy services require your completion and acknowledgment of the “Policies and Procedures” that share my “Professional Disclosure Statement.” That is stored in the secure client portal. Once you log-in, you will be asked to select a username, password, and you will be guided through those policies there. The information provided here is not a substitute for the policies and procedures. For other products and programs, such as digital e-books or audios, or in-person enrichment programs or retreats, if you would like a refund, please contact me within 7 days of purchase with your request. Refunds, full or partial, will not be given after the 7 day period. These products are shared under the Family Life Education division at WomenManagingStress.com. You may find a link to these under the “Products” category at the top of the page. Every effort is made to ensure that the information shared on this site is accurate. There may be typographical, technical, or other human errors. The information provided here is for informational purposes only. It is not a substitute for receiving health care from a licensed professional. There may be products (such as books, programs, etc.) that I recommend. Some of these are affiliate links, meaning that I receive a small compensation from the company should you decide to purchase through that link. Affiliate links do not increase the cost to you at all. All affiliate links will be noted throughout the website. Some examples of things that would have an affiliate link would be a book that I highly recommend or software programs that help therapists and family life educators in their practice or on their websites. I do not endorse or recommend products I do not use or have no experience using. To me, that goes against my personal and professional code of ethics. I, Tammy Whitten, am a participant in the Amazon Services, LLC, Associates Program, an affiliate advertising program designed to provide a means for sites to earn advertising fees by advertising and linking to Amazon.com. There are additional companies of which I am an affiliate. As noted above, all links will be identified throughout the site. Look for the disclosure, along with reviews and additional information on why I recommend such items. Privacy is important, and it is essential that you know how your information is used on this site. Your information is never shared or sold with anyone. If you sign-up to receive a free e-book or to be a part of our Sunday morning chats, no one else will ever see your name or email address. That information is not shared. You may opt-out at any time by clicking at the bottom of those emails and submitting your request easily. If you do receive those emails, from time to time I may be asked by a colleague to share information about their products and programs. I screen such requests and am careful to only alert you to those things that I am confident of their quality and expertise. I send the emails and my colleagues never have your name or email address. Your website browser may be set to store cookies. Cookies are often in advertising and affiliate links, like Amazon or our ad network that is only on WomenManagingStress.com (no ads are on TammyWhitten.com in an effort to prevent any perceived recommendations from the therapy portion of my practice). In addition, Google Analytics provides anonymous data to help me know which pages, posts, and information is the most helpful or may need my attention. All information is protected and is help with the utmost confidentiality.